Churn is the single metric that determines the success of your subscription service. Not every direct-to-consumer business should be a subscription service. Many try to be, and for good reason—subscription businesses often have more predictable revenue than other businesses, they allow you to acquire a customer once and then have a long-term paying relationship with them, and they can quickly create enormous enterprise value. This gives you the rate at which customers are leaving your service as a percentage of the total customers in your service. You should calculate this each month as a total across all cohorts. Why is a monthly churn rate much higher than 5% a problem? Well, think about your service as a bucket. Each month, you do some combination of paid marketing and organic customer acquisition to grow your business. Those new subscribers are placed in the top of your bucket. 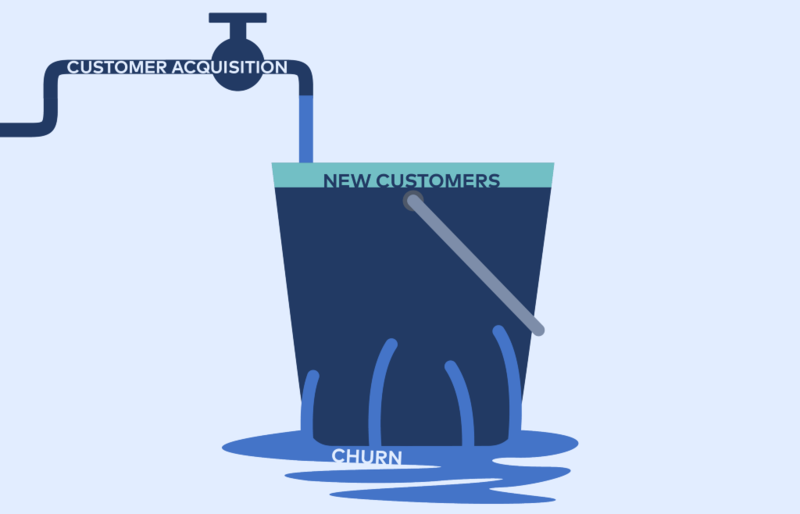 Churn is the hole in the bottom of the bucket. No matter how many new subs you put in the top, you continue to lose customers as they leak out of the bottom. Just to stay flat, you have to replace your churned customers. If a lot leak out, you have to spend/market more to fill the top. The law of percentages has a nasty effect here as well—the bigger you get, the more customers you lose (and have to replace) every month. The larger your business gets, the bigger the holes in the bucket. A 10% monthly churn rate, when you only have 50,000 subs, means you only lose (and have to replace) 5000 subs a month. But 10% churn when you have 500,000 subs, means 50,000 new subs are needed per month, just to tread water. A churn rate of 10% a month effectively means you lose (the equivalent) of all of your customers every 10 months. Those businesses are not sustainable. This is a hard point for some subscription novices to internalize—if you lose all of your customers each year, you do not have a good business. You might have a product or service that some customers want, but you are selling it to them in the wrong model. Your customers are telling you they don’t want to buy every month. One common reaction to this point of view is, “Hey, if some of my customers stay and love the service, who cares if a bunch leave? I will just focus my marketing on more of the people who stay!” This is a fallacy. The basic methods of customer acquisition are all based on targeting to your best prospective customers. Churn is a reaction to your value proposition after people have tried your service. If it is high, you have a problem with the service, not with your targeting. First period churn is always highest, period two is lower, period three usually lower still, and then things tend to steady-state for the remaining periods. The graph below illustrates a typical churn curve, expressing period churn, or the churn of customers in each of the monthly cohorts. Cohorts are a great way to study how customers with similar tenures behave and where best to make improvements in your service. Obviously, reducing first period churn will have the biggest impact on your business. Why are so many people leaving in the first month and can we address their concerns? 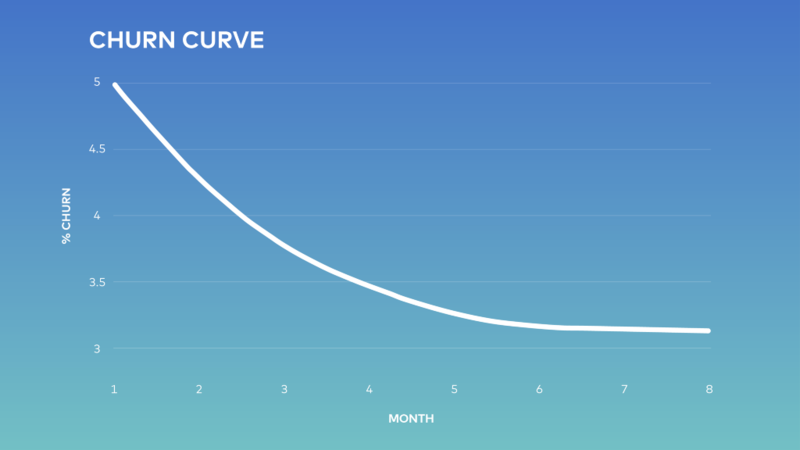 In my experience, almost all subscription businesses follow a similar curve to the one above, albeit with different values along the periods. Focusing on early-period churn obviously pays the biggest dividends. Important to note—the fact that your service tends to steady-state in the out months is not unique to any one service. Average net monthly churn — this is the global expression of churn for your service. Churn for each billing period across your tracked cohorts—this helps you see whether newer users are exhibiting better or worse retention than older users. There is a laundry list of optimizations subscription services implement to improve retention, and collectively these have a positive effect—re-billing insufficient fund accounts on the 15th and 30th of the month, allowing members to pause their service, allowing members to reduce the frequency of delivered goods, winback campaigns to churned members, etc. But a key observation about businesses which show high churn in their early stages is that the churn will not meaningfully reduce. That is, you can expect your optimization efforts to maybe move churn 1% — 2% (absolute points) or so, but they will never halve churn or reduce it dramatically beyond this. This is because churn is a statement from your customers about how habitually valuable your service is to them. In my experience, the only way to meaningfully reduce churn in high-churn businesses is to essentially redesign the service and the value proposition. 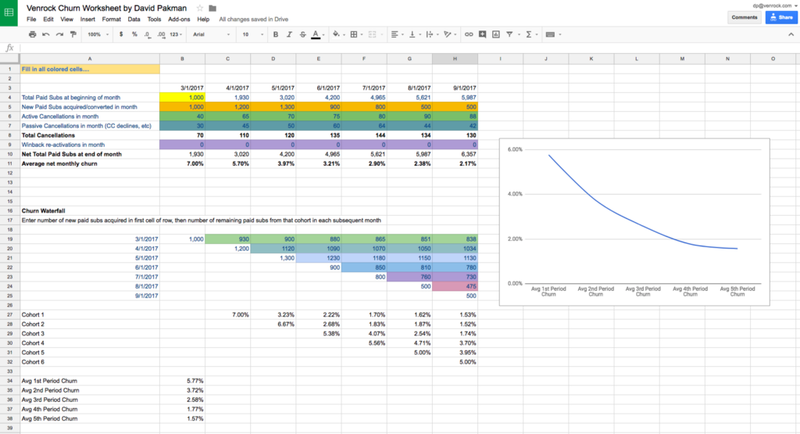 For clarity, I have looked at close to a hundred subscription services and have never seen churn improve from, say, 12% a month to 7% a month without fundamentally changing the service…but I have seen it move from 12% to 10% or thereabouts through optimization. In addition, churn can actually get worse over time as you scale up your customer acquisition efforts. Sometimes your enthusiastic early adopters were your very best customers and as you reach into more and more segments to find new users, the mass market users can turn out to be less loyal, hence churn can worsen. There are plenty of examples of high early growth combined with high churn rates. Investors got excited about the emerging high-growth meal kit market, probably because paid marketing was working very well. That is, in the early days, the services could buy customers for a CAC (customer acquisition cost) that is less than the margin LTV (lifetime value — the sum of all gross margin dollars over the lifetime of the customer) of every customer. This is good math, right? But when the churn is high, the company must spend more every month to refill the leaky bucket and eventually the business hits a wall. CACs continue to rise, total spending starts to get out of hand, and investors get scared. The business is forced to reduce marketing spending to reduce cash burn, starts to shrink, and then things get ugly. A recent example of this is Blue Apron. Their average monthly churn appears to be quite high…perhaps as high as 12% per month. With one million total paid subscribers, they lose about 120,000 subs per month. The cost to replace these lost subs, just to stay flat and not grow, at an estimated CAC of $147, is $17.6 million per month. More recent CACs are $460, so they would spend more than $55 million per month just to tread water. You can see how this becomes unmanageable. High churn businesses (roughly greater than 5% per month) are not great businesses. As they grow, more of their marketing must be devoted to replacing churned customers. They eventually hit a point where shareholders lose patience with the amount of marketing spending necessary to fund growth. When marketing spending is reduced, if the churned customers are not replaced each month, the company can begin to shrink rapidly. This treadmill gets very hard to maintain and ultimately is the undoing of many high-churn subscription businesses. Things may look exciting in the beginning, but the leaky bucket always catches up with you eventually. The recipe for success in subscription businesses is a combination of low churn and large applicable markets. If your churn is high, switch to a different model or redesign the offering to find a lower churn proposition. Churn is the single metric that determines the success of your subscription service. was originally published in pakman.com on Medium, where people are continuing the conversation by highlighting and responding to this story.